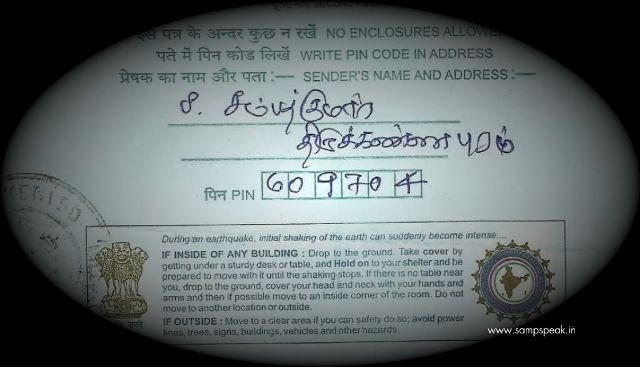 Do you know that besides the Postal address which consists of Door No., Street Name, Area, City …. .. ..there existed something known as PO Bag No. ? ~ here is something which I found interesting during my visit to this divyadesam on 15th Feb 2014. In the business World, small was also considered beautiful and there emerged SMEs (Small and medium enterprises). The abbreviation "SME" is used in the European Union and by international organizations such as the World Bank, the United Nations and the World Trade Organization (WTO). SMEs are also said to be responsible for driving innovation and competition in many economic sectors. Indian SMEs represent the model of socio-economic policies of Government, which emphasise job creation at all levels of income stratum. The current classification marks enterprises in manufacturing sector with an investment in plant and machinery of up to Rs 25 lakh as micro, up to Rs 5 crore as small and up to Rs 10 crore as medium enterprises. Similarly, the limits for enterprises providing services are set at Rs 10 lakh, Rs 2 crore and Rs 5 crore for micro, small and medium enterprises, respectively. 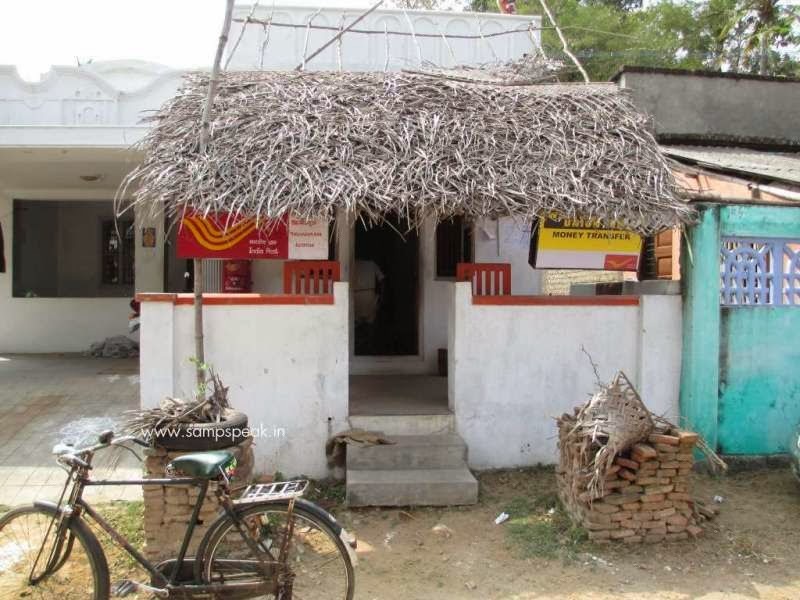 There are organized sources of Credit and unorganized – Banks and other financial institutions offer loans at a reasonable rate of interst; while private money lenders fleece charge high rates… ….yet rural poor have to depend upon moneylenders as they could not provide proper collateral security….. banks at their doorsteps (villages) would be of help, one thought ! ‘Thirukannapuram” – is the abode of Sri Sowri Raja Perumal. 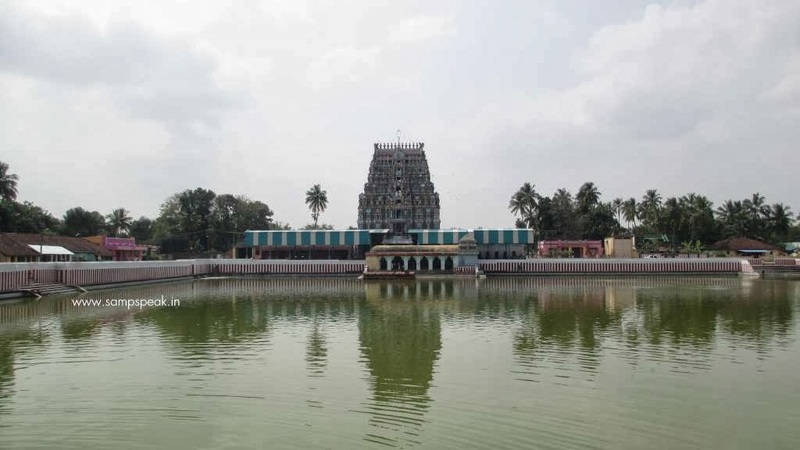 The Neelamega Perumal temple situated near Nannilam on way to Nagapattinam from Mayiladuthurai is a big imposing temple with a beautifully made pond (Thirukulam). From Mayavaram (Mayiladuthurai) as we travel towards Nagapattinam, there is Thirupugalur from where one needs to travel in – for less than 2 km for reaching the temple, which is around 4 miles from Nannilam railway station. The temple has a 7-tier rajagopuram and a vast temple complex. The Nithya pushkarini just infront of the Temple is so vast that it looks more like a large lake… it is neat and clean and a bathe here would cleanse our soul. Till a couple of decades ago, hardly a day would go by without the postman bringing a postcard from a family member or an acquaintance. One used to wait anxiously for the arrival of the postman who used to bring in some important message written in postcards or folded blue inland letters. Sir Post ! [thapal] was the most sought after word to be heard ! ….. Postcards, covers and inland letters used to be the most popular format and at many places the only means of postal communication. In those days, frequent users could register and obtain what was known as ‘PO Bag No.’ ….. it was sort of special space for the recipient at a Postal Office and was an easy way of providing accurate address…. Gone are those days……… I found a Post Office in front of the temple ~ the person manning the Office was exceptionally pleasant ; I bought a inland letter just to post home to show my son that such things existed ~ he said – it is quite sometime since an inland letter was sold there ………. ..and you can imagine its position in a city. Literally none use inland letters these days, whence e-mail itself is considered old-fashioned. People live on SMS / live message / Whatsapp and the like. In those days, Post Office was the most important one in any locality and people lived on covers / cards / inland letters / telegrams / money orders etc., which Post Office transacted besides the postal savings schemes. A system which peaked from the days of East India Company is almost gone now. It is history that the first post office in our Region was established on 01-06-1786 in Fort St George, which later grew into Chennai GPO. At ThirukKannapuram, another board caught my attention ~ that of a bank … not any ordinary branch but ‘Ultra Small Branch’ … what ? RBI guidelines read that an intermediate brick and mortar structure (Ultra Small Branch) may be set up between the base branch and Business Correspondent (BC) locations so as to provide support to about 8-10 BC Units at a reasonable distance of 3-4 kilometres. 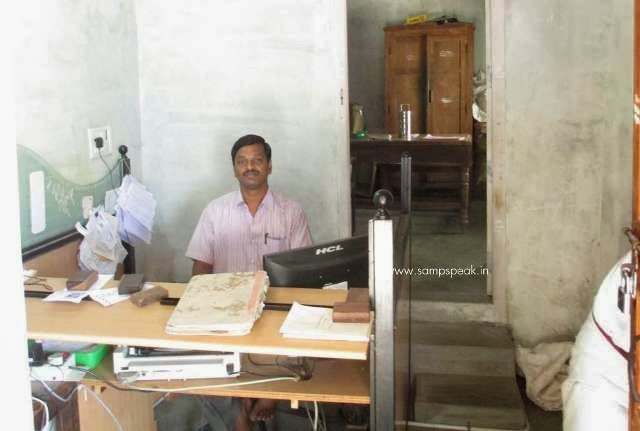 Such Ultra Small Branches should have minimum infrastructure such as a Core Banking Solution (CBS) terminal linked to a pass book printer and a safe for cash retention for operating large customer transactions and would have to be managed full time by bank officers / employees. According to guidelines, such branches will operate in an area of 100-200 square feet. 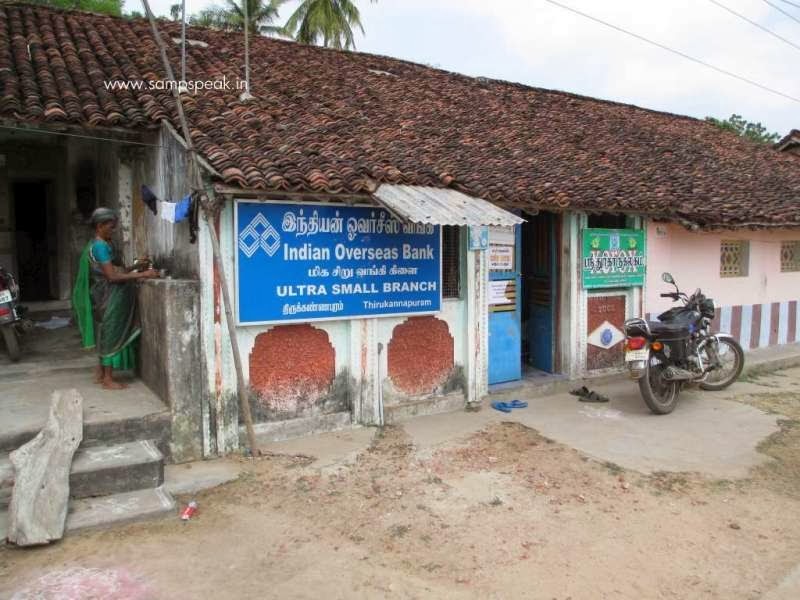 Indian Overseas Bank has opened ultra small branches at some villages and the divyadesam of Thirukannapuram is one !